We’re just back from a month away from home, finding some sun from the wet and grey west coast Canada winter. Travel is always a wonderful opportunity to get perspective on things, our home lives. This little post is a combo of topics from our Canary Islands trip; the practical and some musings. Our primary destination was La Palma, Canary Islands, and got there via Gatwick. For anyone interested in travelling there from western Canada, we flew Westjet, Victoria to Gatwick (return); Easyjet from Gatwick to Tenerife, and from La Palma. We flew Binter Canarias (Canary Islands inter island airline) from from Tenerife to La Palma. Flight costs worked out to be approximately CDN $1200 return per person. Breakdown below, for two people. We rented cars twice, worked out to €460 for 27 days. $720 CDN, or $27.00/day. La Palma was actually cheaper, as we had the car for 22 days. This is an average of Tenerife and La Palma costs together. Generally, food and alcohol were much cheaper in the Canary islands than in Canada. We shopped at HiperDino, a Spanish supermarket chain, and SPAR, a German supermarket chain. We found HiperDino/SuperDino to be superb well stocked and very reasonable. We noticed that the staffing levels of HiperDino to be better than what we experience where I live. Things are definitely more “businesslike” at home. Never extra staff in the stores; just enough to keep people moving. On La Palma, it seemed as though the service jobs were careers, often held by older employees; a different approach to the booming job shortage that we’re experiencing in the service sector here. An observation only. I could be totally wrong on this. It was the high season on La Palma, it’s a very popular destination for German tourists and expats. Some Dutch, and UK tourists; tho I think Canadian travellers were less common there. Accommodation costs can vary; we stayed at a lovely place Amana’s apartment, (we had met Amana ten years earlier during our first stay there). On average, costs are about €50/night, if you can find a place. It is very popular, and depending on the “altitude” of accommodations, they can be hard or easier to find. La Palma is a very steep island, with many microclimates. In my interpretation, on the west side of the island, anything under the 250 metre to the coast/”sea level”, is very coveted. Higher up, and it’s hotter in the summer, cooler in the winter. Our accommodations were at the 180 metre mark – perfect. As the island is incredibly steep, the views are incredible from pretty much anywhere. The eastern side of the island, from Santa Cruz to the airport is very touristy. There are more resorts on this side, it is more dense. 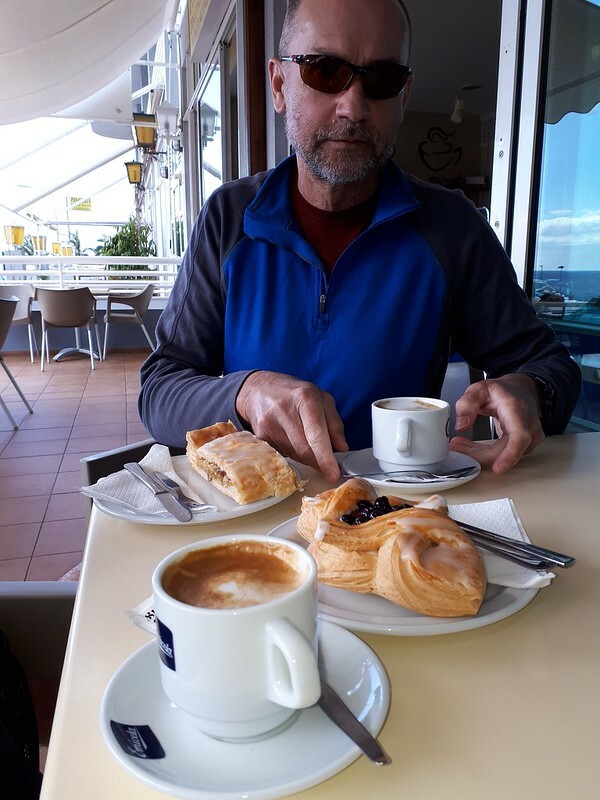 As there is a very strong German influence on La Palma, there are some really awesome pastries and breads from the konditorei’s. The baguettes from the Spars and SuperDino’s were really good. We visited this coffee shop on more than one occasion for cafe con leche, and yummy apple strudel(s)! La Palma is a hiker’s paradise, and probably one of the reasons why Germans travel there so much. Lars and I like to hike too, and we did a lot of it. We were away for a month, and hiking and walking in the Canaries our treads counted 100 kms. The elevation gains were enormous also… Most of our hikes are documented here. We easily walked 10+kms the day we were in London too. So, walks r us! Driving is windy and curvy and a lot of fun. Generally, we found the drivers, whether German or Palmero, or whatever, to be great. It was interesting to see the vehicles, so much smaller than here in North America. Even the work trucks are smaller than the massive pickup trucks that are so common here. “Normal cars” are small – often diesel, and almost exclusively manual transmission. Trucks and busses are narrow – and quiet. We need some of those here. Motorcycles are small too, the Honda Grom 125cc was a very common site, along with scooters. Bigger motorbikes were less common. The attitudes of drivers was better, I think. Where we are in Victoria, there’s a painful sense of entitlement with a lot of drivers, and I don’t think it’s for the common good. Hard to explain, but very interesting to observe. Again, the things you experience when you get out of your home bubble. The other thing we noticed was the two wheeled tourism. 29’er suspension mountain bikes, and road bike riders. La Palma is very steep, 18-20+ per cent grades are not uncommon. We watched a few mountain bikers on the San Nicholas hike – suspension was mandatory. They were bumping down those trails headlong. Good on them, but not for us! On our first visit in 2008, we brought a folding bike – a Dahon 18 speed with us. On some uphill climbs, I remember having to work to keep the front wheel on the ground as the steepness is so extreme. We were avid cyclists then, but we aren’t anymore. The hiking suits us better. There seemed to be a level of simplicity and support on La Palma and Tenerife. Apartments and houses weren’t huge, by any stretch; not like home, where things having just gotten way out of control. Houses here are massive, and it’s ridiculous. It just seemed like a more reasonable way to live; smaller dwellings, smaller cars, less to maintain more time to live. Not sure how to transfer that lifestyle back home, but to try to live more simply is always a good thing.